Projector Model VS220. Lamp Life 4000. Zoom Lens Ratio 1.35:1. Special Features USB port. Brightness (Manufacturer Claim) 2700. DVI or HDMI Yes. Audio 1.0W Mono. Noise Level (-db) 37.0. Condition is Used. 3000 hours. Epson PowerLite W29 Model: H690A WXGA 3LCD Projector 300 Lumens HDMI 720p VGA. Gently Used. Includes remote, power cord, VGA cable, software disk, manual and original box. Ships quickly and carefully. Thanks! The Projector have being tested , but need a Lamp. The projector has been tested, working properly and the remote works as well. Use a standard USB cable to connect to your computer or other USB device. 3-chip technology. If you choose to install your projector, power the projector on and off with the flip of a wall switch with Direct Power On/Off. Ultra short throw distance. In Excellent Condition. Built-in 10W speaker, closed captioning decoder. Very good condition, works great, includes cables and carry case.no remote. This unit is in excellent working condition. It has signs of use, as can be seen in the photos. The bulb in this unit is working. But it is working perfectly. Epson Home Cinema 3600e 3D 3LCD Home Theater Projector - 160 Lamp Hours! Epson PowerLite S5 LCD Projector. Condition is Used. Shipped with USPS Priority Mail. 1522 high brightness hours. 139 low hours. Good condition. Power cord included. There is noticeable wear on the body from normal use, as shown in pictures. It does not affect the functional integrity of the projector whatsoever. Remote NOT included. If you would write ‘Recycle” on the outside of the box and send it back we will make sure your item gets processed through the proper local downstream when it arrives! Trending at $26.16eBay determines this price through a machine learned model of the product's sale prices within the last 90 days. Display Type: 3LCD. HD Video Mode: 1080i. Audio may not be supported. Projector Weight: 6.9 lb. Lamp and filter are cleaned to improve image quality and extend projector life. Projector is Professionally Tested and is in Good Working Order. Condition is Used. The lamp in the projector has been used for 519 hours. It has been tested and works perfectly with no known issues. The lamp hour count is 124. Very nice! Batteries for remote are NOT included (requires AA). This includes Canada. Epson PowerLite 1705c 3LCD Projector. 2200 Lumens, Model EMP-1705. 5 out of 5 stars - Epson PowerLite 1705c 3LCD Projector. 2200 Lumens, Model EMP-1705. 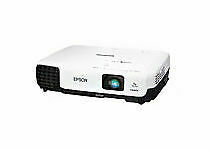 1 product rating1 product ratings - Epson PowerLite 1705c 3LCD Projector. 2200 Lumens, Model EMP-1705. Epson Home Cinema 2045 H709A 1080p Home Theater Projector. Condition is Used. Shipped with USPS Priority Mail. Included with remote(missing back cover) and power cord. case has a few marks. Lamp 124 hours used. included with new remote. fan is loud. case will have marks. Epson PowerLite 83+ LCD Projector NO RESERVE!!!!! One of the best on the market! No scuffs or scratches. Make any room a movie room! Power cable included. The 84 is a much better model, and it's all I have left, so yay. 4.5 out of 5 stars - Epson PowerLite 83+ LCD Projector NO RESERVE!!!!! One of the best on the market! 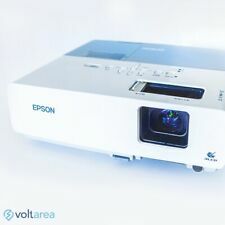 75 product ratings75 product ratings - Epson PowerLite 83+ LCD Projector NO RESERVE!!!!! One of the best on the market! Condition is Used. No i nt er na ti on al s hi pp in g. On ly continental US A! (Condition is Used. So you will get a min of 4 but 6-8 is possible). I will find out of the count this weekend! They like it better than movie theater 3D so I need to take them to the movies less often. 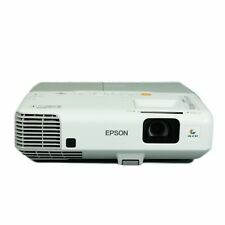 Epson PowerLite 1776W Projector 3-LCD 1280x800 3000-lumen HDMI H4760A. Condition is Used So sold AS IS. Shipped with USPS Priority Mail. Epson Home Cinema 5030UB 2D/3D Full-HD Projector Excellent Working Condition! Projector has the original lamp with approx 1650 hours out of a possible 4,000 to 5,000 (eco mode) hours. Projector in perfect working condition with zero issues. No dead pixels! No scratches or marks! 5 out of 5 stars - Epson Home Cinema 5030UB 2D/3D Full-HD Projector Excellent Working Condition! 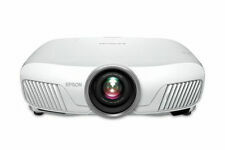 14 product ratings14 product ratings - Epson Home Cinema 5030UB 2D/3D Full-HD Projector Excellent Working Condition! This has been tested and working. Good used condition. Does not include the remote. Has 1950 hours on the lamp. Television sizes grow bigger by the day and so do their prices. However, there's a way to get a theater experience at home without having to invest in a huge TV. One way is with an Epson projector that you can mount in your home, but before you buy a projector, you should know the answers to a few common questions. What devices can you hook up to an Epson projector? Can Epson projectors display 4K resolution? Not all projectors offer a 4K resolution. 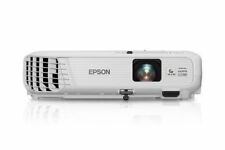 However, some Epson projector 4K models are available. Those that support 4K resolution typically cost more but display a crisper picture. It's also important to remember that the quality of the picture being projected depends heavily on the screen on which you project it. With a high-quality screen, even an Epson projector with 1080p resolution will provide an image that's on par with most TVs. How large of a picture does an Epson projector display? The size of the picture depends heavily on the make and model of the Epson projector that you choose. For example, the Epson projector Home Cinema lineup can display a nearly 25 times larger picture than a 60-inch flat screen TV. In most cases, this is large enough to cover an entire wall in a home. These projectors can support this large picture size because they have three times higher color brightness over digital light processing. Do Epson projectors have built-in speakers? Some Epson models have built-in speakers for ease of use. These speakers are typically located on the back of the projector and play audio directly from the source. Many of them also offer hookups in the back that allow you to connect external speakers for even more audio options. The size of the room you place your projector in will determine if you need additional speakers or not. Most units come with a remote control too, so you can easily adjust the sound and size of the picture from the projector. Regardless of whether you want speakers or not, you can find what you're looking for on eBay. Content provided for informational purposes only. eBay is not affiliated with or endorsed by Epson.